HR6, landmark opioid legislation, was signed into law by President Donald J. Trump on Wednesday, October 24, 2018. DisposeRx CEO, Dr. John Holaday, attended the ceremony at the White House and had the honor of being recognized by the President for his dedication, commitment and passion to finding solutions to the opioid crisis. 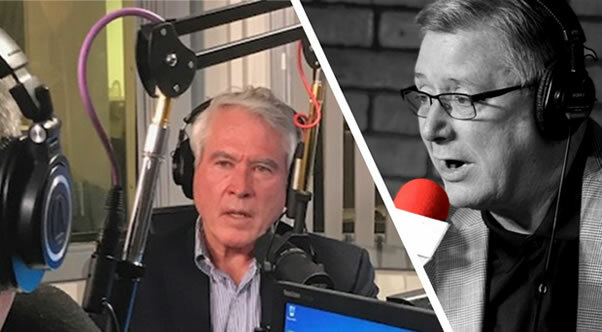 Dr. Holaday talks to WTN 99.7FM radio show host, Brian Wilson about the historic event, the challenges we face with the opioids crisis going forward, and what people can do simply and easily at home to help in the fight against drug addiction and abuse. LISTEN TO THE RECORDED INTERVIEW ON YOUTUBE HERE. READ ENTIRE TRANSCRIPT BELOW. Brian Wilson:	It was a busy day at the White House yesterday with all that was going on in the world, but they took time out to sign new legislation aimed at tackling the opioid crisis that we’re in right now. There are new statistics out. More than 70,000 Americans died of drug overdoses last year, 70,000, and of those roughly about 50,000 had to do with opioids. We are in the midst of an opioid crisis. Joining me on the line right now is somebody was there yesterday at the signing ceremony, someone who has dedicated his life in recent years to trying to find some solutions to the opioid crisis, Dr. John Holaday. By way of full disclosure, I have a relationship with Dr. John Holaday in that I have worked on a series of podcasts about this issue for his company, DisposeRx. Good morning to you, Dr. Holaday. Dr. John Holaday:	Good morning, Brian. Glad to talk to you again. Brian Wilson:	All right. Let’s talk a little bit about what happened at the White House yesterday and this new legislation to be there in the White House and see it signed into law must’ve been something for somebody who cares so deeply about this issue. Dr. John Holaday:	It was certainly a distinction and certainly to hear in their own words and the words of the President how much the entire opioid epidemic has affected their own motivation to help do something about this crisis and taking the active steps to do that. Congress passed Legislation HR6 bicamerally and also with both parties fully endorsing it, as a consequence he signed that into law yesterday. It’s exciting. It’s going to make a difference. HR6 includes a lot of components. It’ll certainly help us fight this epidemic. 70% of this begins in the medicine cabinet where people take leftover drugs or they are taken from medicine cabinets by others and abused until the point they can’t afford them any longer. They turn to heroin that’s now laced with fentanyl, which is a deadly, very strong drug and they die. Brian Wilson:	So, where are we right now because some are saying maybe it’s the beginning of the end, maybe it’s leveled off a little bit. But when you talk about nearly 50,000 people who died of a opioid overdose in America, that’s a huge and staggering statistic. Dr. John Holaday:	… and one that we’re, unfortunately, not seeing any decline in as of yet. The real culprit here is fentanyl, which is lacing heroin. 70% of this begins in the medicine cabinet where people take leftover drugs or they are taken from medicine cabinets by others and abused until the point they can’t afford them any longer. They turn to heroin that’s now laced with fentanyl, which is a deadly, very strong drug and they die. Dr. John Holaday:	Well, we’re talking about everything from Oxycodone and Vicodin and Percocet to Tramadol. They all have different names. But they’re common in the fact that they all are opioids. They relieve pain but they also cause respiratory depression in high doses, which is the cause of death. All of these opioids are potent pain relievers, they’re necessary to manage pain but unfortunately, their availability also contributes to the death that we’re seeing in this epidemic. Brian Wilson:	Now, you have dedicated your life to finding some way to stop it from becoming a problem right in the medicine cabinet. So if people see that there are opioids in their medicine cabinet and you’re supposed to get rid of them if you don’t use them, but you can’t flush them because that hurts the environment. How do you get rid of them? You’ve come up with a product called DisposeRx. Talk about that. Dr. John Holaday:	Certainly. It’s similar to when you buy flowers, there’s a packet that comes with the flowers. You put that in the water and preserve their life. Why not, when you get a prescription for a drug like an opioid, get a little packet and when you’re through with them, put the powder and water into the prescription vial, shake it. Within a minute, with our product, it’s permanently captured and unavailable for, not only abuse, but unavailable for leaching into the waters. So it’s a simple, safe solution that’s available at Walmart, Rite-Aid and hopefully other pharmacies with every prescription of an opioid so that you can get rid of them in a way that they can’t be abused and won’t pollute. Brian Wilson:	And that’s right. It turns into … I’ve done this actually. You pour a little water, you pour the powder, you shake it a bit. It turns into sort of a harmless goo, right? Dr. John Holaday:	That’s correct and the goo by itself is generally recognized as safe. So it’s made from materials which are certainly not toxic to humans and often found in many medicines. But it both captures them chemically, as well as physically in this goo. Over time, that develops mold and bacteria and degrades. Brian Wilson:	If people look in their medicine cabinet, they say well, I’ve got this stuff. Maybe I should hold onto it in case I ever, you know, tweak my back or I need a pain pill for some reason or another. That’s really dangerous right now because it’s there and it can be misappropriated and be misused. It really is sort of a hidden danger, isn’t it? Dr. John Holaday:	It is. It’s a death trap. So on the 27th of this month, the FDA is promoting its Take Back Day, where you can get in your car and drive to a Take Back facility and put the drugs into containers. They collect millions of pounds of these, but mostly it’s not opioids. It’s things like medicine bottles, et cetera. As an alternative to Take Backs and kiosks, we offer an at-home solution or site of use solution, which enables the user to destroy their drugs at home and throw them safely into the trash. It’s easier and it’s also far less expensive in terms of time and cost. Brian Wilson:	Well, I just want to say this series of podcasts that I work with on behalf of your company that are out there right now, they really give you a lot of great information. We talked to some of the real experts in the entire world on this issue and if people want to listen to it, I host it. It’s called, “Opioids: Hidden Dangers, New Hope.” And you can find that at Opioids-HiddenDangers-NewHope.com. Dr. John Holaday, thank you so much for joining us here on Nashville’s morning news. Dr. John Holaday:	Thank you for the opportunity to share my passion. Brian Wilson:	Absolutely. And by the way, really, we do have a problem in the middle Tennessee area. This may be and many people think, ground zero for the opioid crisis. There are things you can do to keep people from starting down the pathway by just taking a few moments to look at what’s in your own medicine cabinet.